In Brazil's biggest protests since the end of the military dictatorship in 1985, thousands have poured into the streets in cities cities across the country to denounce President Dilma Rousseff's appointment of her predecessor and political mentor, Luiz Inacio "Lula" da Silva, as chief of staff. Days of nationwide demonstrations reached a climax as Lula was sworn in on March 17. In Brasilia, riot police fired pepper spray to disperse protesters who massed outside the presidential palace, chanting "Dilma out!" Demonstrators say Rousseff transparently appointed Lula in order to give him immunity as he comes under investigation in a corruption scandal at the state oil company Petrobras. Lula was briefly detained by police for questioning March 4 over allegations of money laundering connected to "Operation Car Wash," a massive investigation into corruption at Petrobras. On his release without charge, leaders of the ruling Workers' Party (PT) urged supporters to wage a "political war" against "coup-mongers." On March 10, São Paulo state prosecutors asked a judge to issue an arrest warrant for Lula in a separate case, asserting that he had concealed ownership of a seaside property. Lula denies both allegations, saying they are aimed at preventing him from running for president again in 2018. Hours after Rousseff announced Lula's appointment March 16, Judge Sergio Moro, who is heading the Petrobras investigation, ordered the release of an intercepted phone call between the pair, seeming to acknowledge that Lula had been appointed to give him immunity from prosecution "if necessary." Shortly after Lula's swearing-in, a federal judge in Brasilia issued an injunction to suspend his appointment on the grounds it prevented "the free exercise of justice." The Attorney General of the Union said it would appeal to a higher court, allowing the appointment to move ahead. Moves to further open Petrobras to private investment and partnerships with foreign companies have also sparked protests in recent years—especially following revelations that the company had been targetted for surveillance by the US National Security Agency. The effort to remove Dilma and her party from power now resembles a nakedly anti-democratic power struggle more than a legally sound process or genuine anti-corruption movement. Worse, it’s being incited, engineered, and fueled by the very factions who are themselves knee-deep in corruption scandals, and who represent the interests of the richest and most powerful societal segments long angry at their inability to defeat PT democratically. Of course we have the bogus propaganda word "narrative," implying that the other guys' POV is merely subjective, while here you are reading the Straight Dope. Ironically, that word is almost always employed by those with the most bias of all. Can you imagine Greenwald's vitriol if Obama re-appointed Clinton to the cabinet to shield her from prosecution in the e-mail scandal? But when Dilma does same for Lula, he spouts the party line about how the protesters are all bourgeois puppets of imperialism—the same propaganda routinely used in Argentina and in Venezuela. And this is the same Brazilian regime that is screwing over the Brazilian poor by seizing their lands to build stadiums all over the damn place, and terrorizing them with murderous police to create an attractive climate for foreign capital. And turning the country's natural resoueces over to the extractive interests. Is the right-wing opposition exploiting the protests? That goes without saying. But "inciting" and "engineering"? As if nobody had any legitimate reason to be pist at Dilma? Come on. 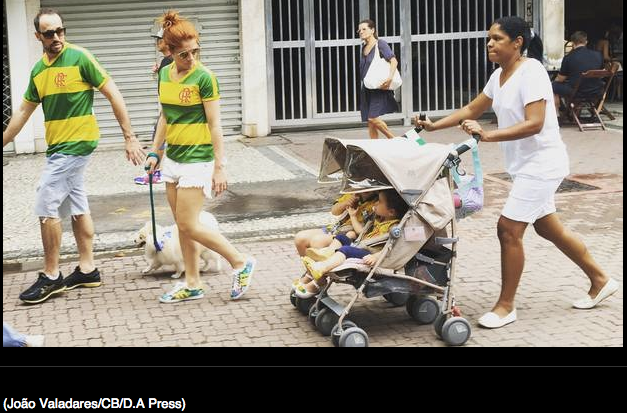 We are treated to a photo that apparently went viral among Dilma's supporters purporting to show a well-heeled couple out for the protest with their pure-breed dog on a leash—and a Black nanny pushing the baby carriage. It has apparently been posted with snarky captions like "Speed it up there, Maria [the generic 'maid name'], we have to get out to protest against this government that made us pay you minimum wage." Yet apart from the couple's matching green-and-yellow t-shirts (the colors of the Brazilian flag, adopted by the right-opposition), there is nothing in the photo to indicate they are actually out for a protest as opposed to, say, lunch or shopping. Do even bourgeois types typically bring their pets and tots to protests where cops are likely to use pepper-spray? Just asking. Greenwald certainly doesn't. None of this is a defense of PT. Both because of genuine widespread corruption in that party and national economic woes, Dilma and PT are intensely unpopular among all classes and groups, even including the party’s working-class base. But the street protests — as undeniably large and energized as they have been—are driven by those who are traditionally hostile to PT. The number of people participating in these protests — while in the millions—is dwarfed by the number (54 million) who voted to re-elect Dilma less than two years ago. In a democracy, governments are chosen by voting, not by displays of street opposition—particularly where, as in Brazil, the protests are drawn from a relatively narrow societal segment. So it's not a defense of the PT... except that he goes on to defend the PT in the next breath, again paint the protesters as dupes incapable of autonomous action, and imply that being elected by a large majority is a license to abuse the populace in peace. As we have had all too many reasons to ask in recent years: Remember when the left used to fetishize balaclavas and Molotov cocktails? Today it seems to more often fetishize police uniforms and truncheons. What's up with that? You know, we've been calling out Dilma Rousseff and her propaganda partisans as disingenuous for screaming "coup" when the effort to unseat her is coming from Brazil's elected congress and is using (however cynically) legal mechanisms. But as Congress voted to impeach this weekend, Jair Bolsonaro, a right-wing deputy from Rio de Janeiro, dedicated his "yes" vote to Carlos Brilhante Ustra—the colonel who headed a notorious torture unit during the military dictatorship! Rousseff, then a young urban guerilla, was among those tortured by the unit. Bolsonaro's move prompted left-wing deputy Jean Wyllys to spit at him, The Guardian informs us. Way to play right into your opponent's propaganda, Bolsonaro. A Brazilian federal judge on April 5 issued a warrant for former president Luiz Inacio da Silva's arrest. Judge Sergio Moro issue the arrest warrant several hours after the Supreme Federal Court's denial of a request for habeas corpus from da Silva, who wanted to remain free while he appealed his 12-year prison sentence. The former president was convicted of trading favors with a construction company in exchange for a luxury beachfront apartment.